There are only a handful of household accessories that can boast to be as versatile as a kitchen sink. And as the centerpiece to your kitchen, the decision of choosing the right one will affect your daily life for years to come. But that decision is by no means simple. From sensible space utilization to ergonomic design, there are a lot of features that a kitchen sink should be judged on. And if you are planning on replacing the old sink and getting a new one that can fulfill your needs, then we can understand your dilemma. So, to help you out today, we bring you a review on a crowd pleaser. The VIGO Farmhouse Kitchen Sink is one of a kind when it comes to improving on a kitchen’s aesthetic appeal. And we’re sure it will fulfill all your needs as it did for so many others. Why can the VIGO Farmhouse Kitchen SInk be your pick as well? What about the VIGO Farmhouse Kitchen Sink disappointed us? What attracted us most towards the VIGO Farmhouse Kitchen Sink was how it took an age-old rural concept and gave it a modern twist. With the help of a reversible apron front sink design, the VIGO brightens up the aesthetics of even the dullest of kitchen interiors. 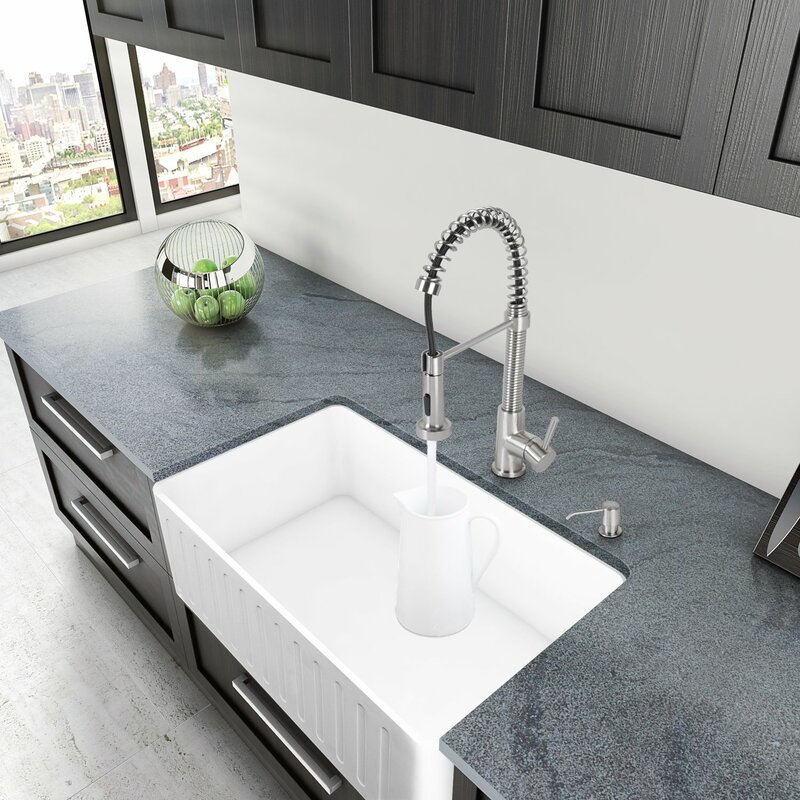 Crafted out of their own proprietary Matte Stone, the VIGO kitchen sink is not only easy to clean but sturdy as well. And with a solid core of PMMA composite surface, the sink is highly durable and stain resistant. Let us take an in-depth look at all its core features. The VIGO Farmhouse Kitchen Sink comes with two types of face aprons that can be easily alternated based on your preferences. With the slotted face, you can avail a more hip and modern look; the smooth face will fit your need like a glove if vintage is your cup of tea. Additionally, the sink comes with an ‘all mounting hardware’ which simplifies the process of installing it along with the versatile apron. And the extra accessories of stainless steel strainer and VIGO cutting board are a fantastic bonus as well. As mentioned earlier, the VIGO Kitchen Sink is made out of Matte Stone. This proprietary PMMA amalgam makes the sink look new for an extended period of time. And the thoughtful addition of sanded surface makes sure that both the sink exteriors and interiors are easy to clean. The matte exterior also helps in bringing a unique texture to the aesthetic appeal of your kitchen, while the glazed interior helps simplify the process of rinsing the dishes. 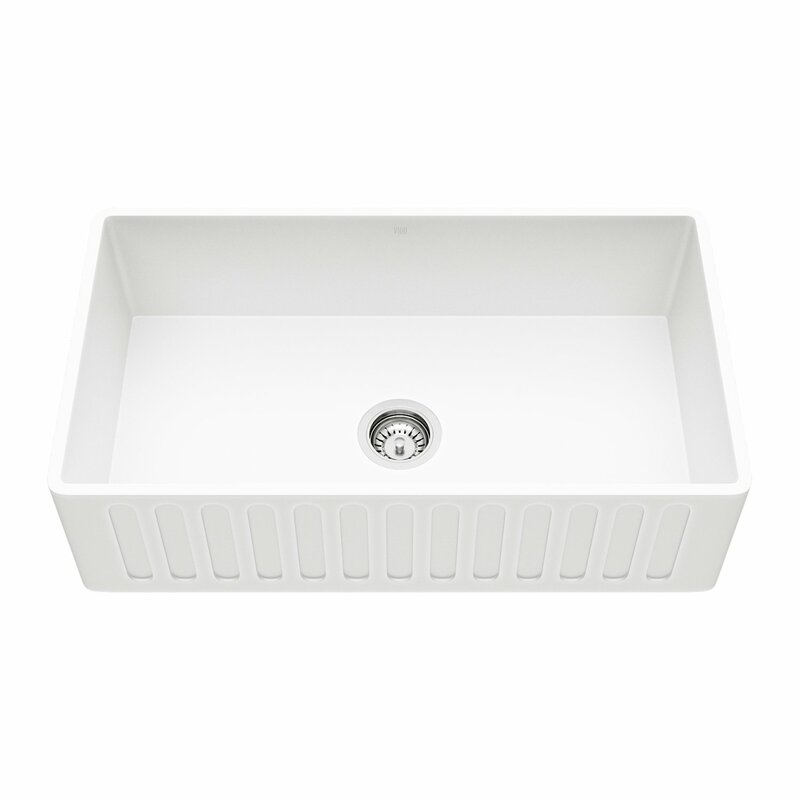 Unlike most of the average sinks found in the local market, the VIGO, instead of using outdated fireclay, is constructed of one solid material without a dark sublayer. This, in turn, helps in completely eliminating the risk of any dark cracks appearing on the white surface of the kitchen sink. Each of the kitchen sink parts is hand-sanded and polished to give it a heightened glazed feel that brightens the kitchen interior. And the non-porous PMMA not only provides a solid core construction but also makes sure that the sink maintains its appearance and functionality for years to come. Even though a fantastic household product that not only completes the kitchen but enhances its aesthetic appeal as well, the VIGO kitchen fell short of our expectations in certain crucial areas. Due to its matte stone base, it will require re-sealing once every few years. Stability was also an issue, as the vessel sinks are only tethered down by the faucet, it can be dangerous for young children who try to use the sink as a handhold. Additionally, while the material is easy to clean, your cleaning job doubles as now you have two visible surfaces to clean. 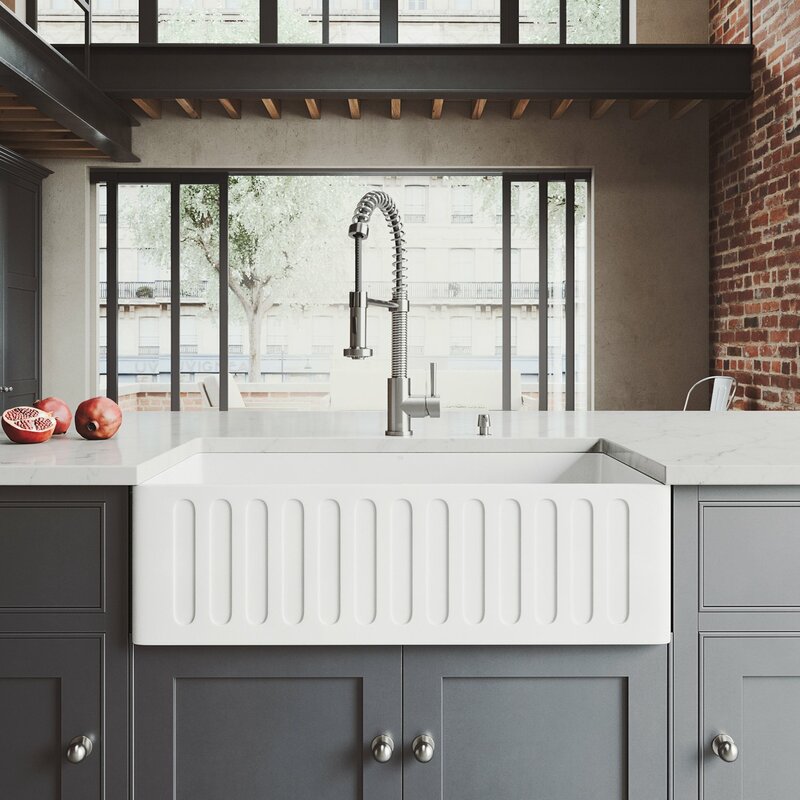 From functionality to fantastic aesthetics, the modern day kitchen needs a little bit of everything, and the VIGO Farmhouse Kitchen Sink can satisfy that and more. With its unique matte stone finish and versatile face aprons, it’s one of the most popular kitchen sinks in its class. We hope you enjoyed our kitchen sink review and found it to be helpful. We’ll see you in our next review!